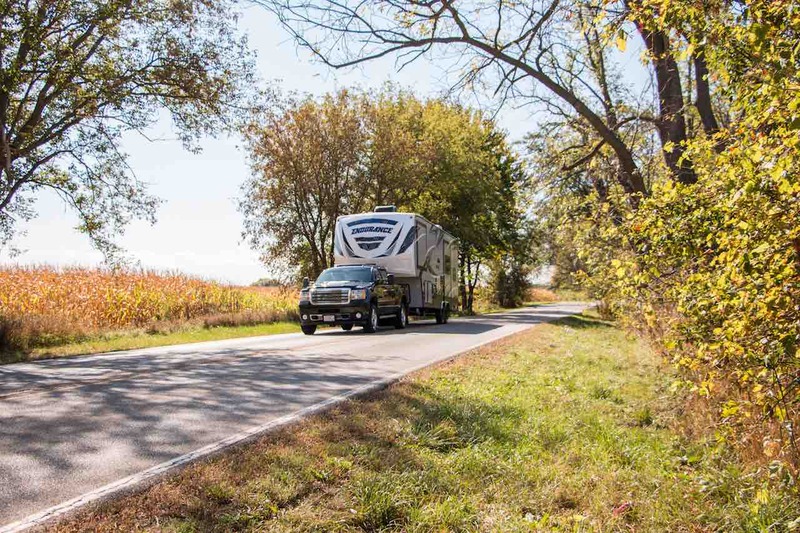 When it comes to towable RVs—like fifth-wheels, travel trailers, or pop ups—you need to have a strong and reliable tow vehicle. 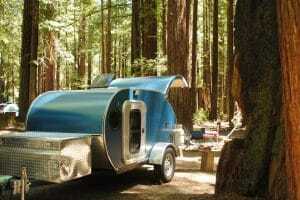 The vehicle has to have the towing capacity to be able to handle the duties of moving the RV from place to place. It also must be a reliable vehicle so you don’t end up stranded somewhere. 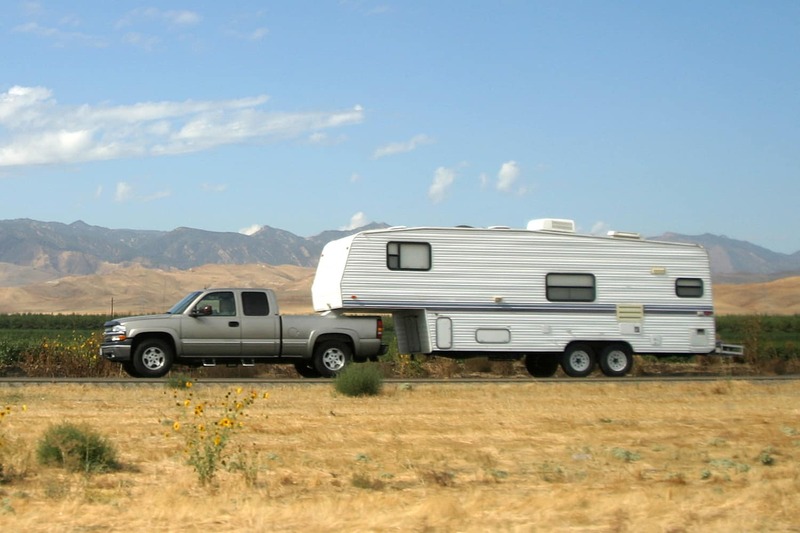 I’ve met several people who went out and bought a vehicle to tow their RV about the same time that they bought their travel trailer or fifth-wheel. Some of them bought a brand new tow vehicle. Others bought a used tow vehicle. Both gave fantastic reasons as to why they did so. I thought it’d be worth it to take a look at the pros and cons of both, so you can make the decision for yourself if you need to. 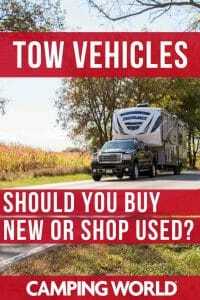 The most obvious reason for buying a used tow vehicle is it will be less expensive. If you’re on a budget and a brand new truck or large SUV to tow your RV is out of the question, you can probably find a used vehicle that will work. When buying a used vehicle for towing your RV, you need to start with all of the obvious car buying advice. Make sure it’s had no accidents via a vehicle history report, buy something that’s been well taken care of and with low miles, find a make and model that has a good reputation for reliability, and you should be sure to buy a vehicle that will get the job done as a towing machine. A perk of buying a used tow vehicle is that insurance will likely be less expensive. Older vehicles are generally less expensive to insure. Registration and taxes on a used vehicle are less, too. All of those things can help keep the overall cost of the vehicle down. Another nice perk of buying a used tow vehicle is that you might find you can buy a higher trim level with more luxurious features and amenities for the money. Vehicle depreciation means that the high dollar options in a new vehicle can be had for a fraction of that price on the used market. While you won’t get the latest and greatest technology and features, you can still get some of the best features from a few years ago for less on the used market. On the flip side, many people want to buy a new vehicle for their tow vehicle, and I get why. Most importantly, you know for sure there’s nothing wrong with it. You know it will perform how it’s supposed to and should do so for several years before requiring any serious maintenance or repairs. In a new vehicle, you’ll also enjoy the latest features and technology, this can go a long way towards making your long road trips more enjoyable. Speaking of long road trips, new vehicles get better gas mileage due to performance developments, so while you’ll spend more on the vehicle, you might spend a little less on gas. Also, new vehicles have the latest and greatest safety systems. This is extremely important if you’re doing a lot of traveling with your whole family or with your grandkids. Many used vehicles offer good safety systems, but new vehicles will often be the safest. 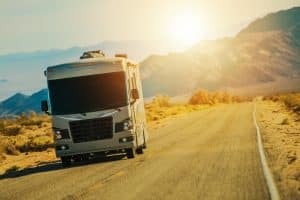 When shopping for a new SUV or truck to tow your RV, you still need to focus on brands and models that have a history of longevity and reliability. It’s also smart to think about vehicles that retain their value well. The biggest downside of buying a new vehicle is that it depreciates considerably from the moment you drive it off the lot. If you get one that retains its value well, then you’ll be less impacted by depreciation. Buying used or new means you have to take a good hard look at your finances and decide what’s right for you. It’s not an easy choice and there’s plenty of reasons for choosing either option. While I personally lean towards a used vehicle that’s only two or three years old with low miles on it, no accidents, and a good maintenance record, I see the merits of a new vehicle. What was the last tow vehicle you bought? Did you buy new or used? Why or why not? Leave a comment below!